City Arts has been central to the development of this festival led by ArtReach, Independent Creative Producers. First bursting onto Nottingham’s streets in 2010, Night of Festivals has a huge vibrant carnival at its heart. Led by the extraordinary carnival creativity of Mandinga Arts, it has involved day of the dead inspired skeletons (big and small), dancing ladies in enormous biana skirts, face paint, masks, and much more. City Arts works to bring these international carnival opportunities to people in the City. 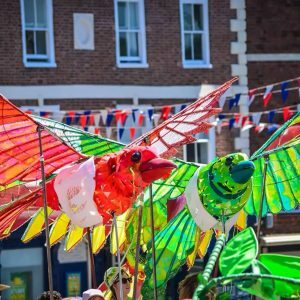 We work with the Mandinga team to animate their amazing costumes and puppets with local young people, artists and carnival enthusiasts. The lead choreographer from Mandinga works with these groups to develop and animate each different set of costumes, bringing different dances and themes across the carnival. City Arts on-going partnership with ArtReach sees us once again leading on the community engagement and producing the carnival programme for Night of Festivals. We recruited over 40 volunteers, from young people, university academics, musicians, artists and the general public to bring to life the extraordinary creations from Mandinga Carnival Company, and to work with Paraiso School of Samba. 2013 also saw our Dome at the heart of the festival, with an exciting programme of music, performance and installation being hosted in the space. This year, Night of Festivals has Arts Council Strategic Touring funds and will be going to Boston in October 2013, and Slough and Leicester in 2014. 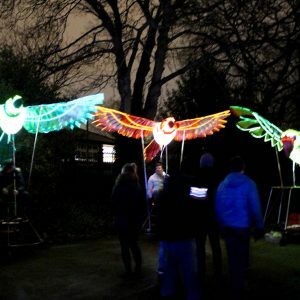 The partnership with ArtReach and City Arts in 2012 saw the line-up for Night of Festivals Carnival extended. City Arts produced an extensive percussion programme with Paraiso, offering skills and development opportunities for musicians in the region. Mandinga were resident at City Arts, where rehearsals with community volunteers animated their wild and wonderful costumes. New elements for 2012 saw artists and muscians from Haiti and Little Haiti in Miami come to Nottingham. Percussion collective Rara Lakay from Little Haiti were in residence with City Arts for ten days, delivering workshops with schools and community groups. Rara is a form of music specific to Haitian Carnival that involved both drums and bespoke tin horns. Artists from Atis Rezistance were in residence in the City Arts studio, creating a new sculpture as a centrepiece for the festival. The sculpture started as a 2.5 metre Sweet Chestnut log embedded with junk gathered from the Nottingham Recycling Centre. Five days of carving later and Queen Ersulie emerged. City Arts once again joined Artreach in a wonderful weekend of carnival events. London carnival arts company, Mandinga, brought their costumes back to Nottingham for local people to perform in. 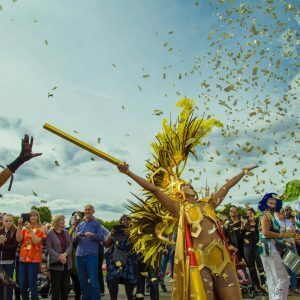 After a weekend of rehearsals with the Mandinga lead choreographer, the dancers took to the Market Square on Saturday 28th May, creating four carnival interventions with musicians from Rhythms of the City. On the Sunday, the characters found their way over to Wollaton Park, and the Children’s Festival picnic, where they thrilled, delighted and terrified children. We also brought the giant chimes, and the newly created smaller chime instruments. City Arts was approached by ArtReach to support in the delivery of Night of Festivals, a three day celebration of Contemporary Latin American Culture. ArtReach had successfully secured funding from a number of sources, including Igniting Ambitions(Cultural Olympiad in the East Midlands) and a number of South American Embassies. ArtReach commissioned London Based Mandinga Arts to create a carnival centrepiece for the whole event. Mandinga, although based in London, are inspired by all things Latin. City Arts worked with Mandinga to fill their carnival with artists, young people, musicians and dancers all based in Nottingham. Over two weekends, Mandinga choreographer Marianna Whitehouse worked with different groups to create the different sections of the carnival. The Friday night procession was a huge success, with a small number of keen performers coming back on the Saturday to put on full makeup and costume to go back out to entertain the crowds with a number of small interventions. City Arts also hosted an artist training session with Artistic Director Charles Beauchamp, who offered insights into the Mandinga style.